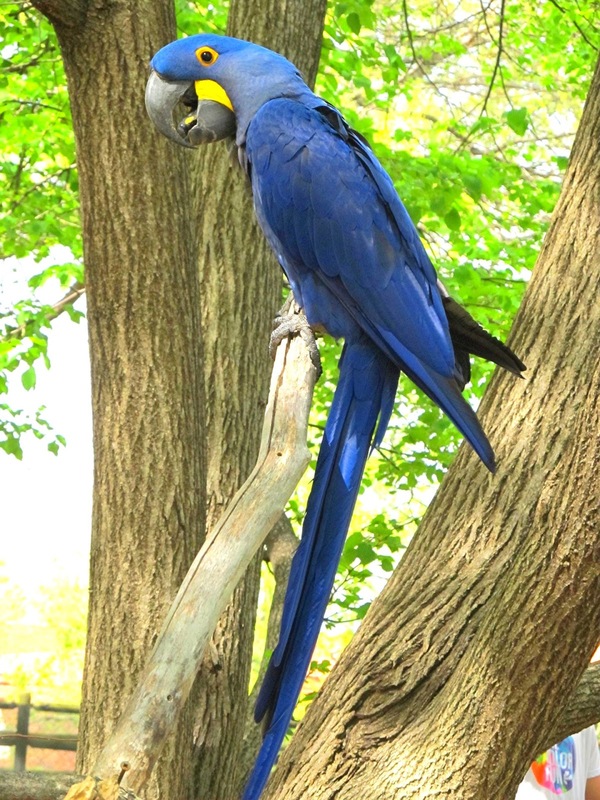 Most ornithologists currently recognise 17 species of living macaw. However, there are varying degrees of evidence to suggest that several additional forms have also existed in modern times but do so no longer. Some of them were confined to various Caribbean islands, and I have previously reviewed those examples briefly here on ShukerNature (I have now conducted and written up a much more extensive investigation of their cases that will be appearing shortly). But the ostensibly lost, highly controversial species under consideration by me right now hailed from continental South America – and, who knows, it may still do so. Some of the most spectacular of all macaws are unquestionably those breathtaking beauties in blue that belong to the genus Anodorhynchus. Both in size and in colour, the three officially-recognised blue macaw species belonging to this genus exhibit an interesting gradation. The largest of this trio is the hyacinth or hyacinthine macaw A. hyacinthinus, named after its magnificent, exclusively blue plumage. 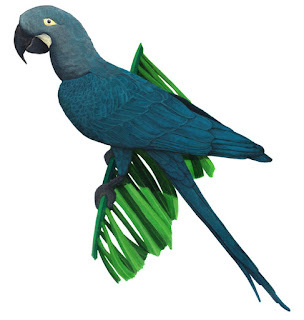 Next in line is the mid-sized Lear's macaw A. leari, in which much of the hyacinth macaw's vivid cobalt shading has been replaced by subdued turquoise. Then comes the glaucous macaw A. glaucus, slightly smaller than Lear's, with a plumage incorporating (as its name stresses) a subtle range of greenish-blue and sea-green hues - particularly upon its head, belly, and the upper surface of its tail feathers. In addition, its throat is brownish-grey, and the feathers around the lower portion of its face are sooty in colour. Tragically, however, this last-mentioned species is now extinct – or is it? 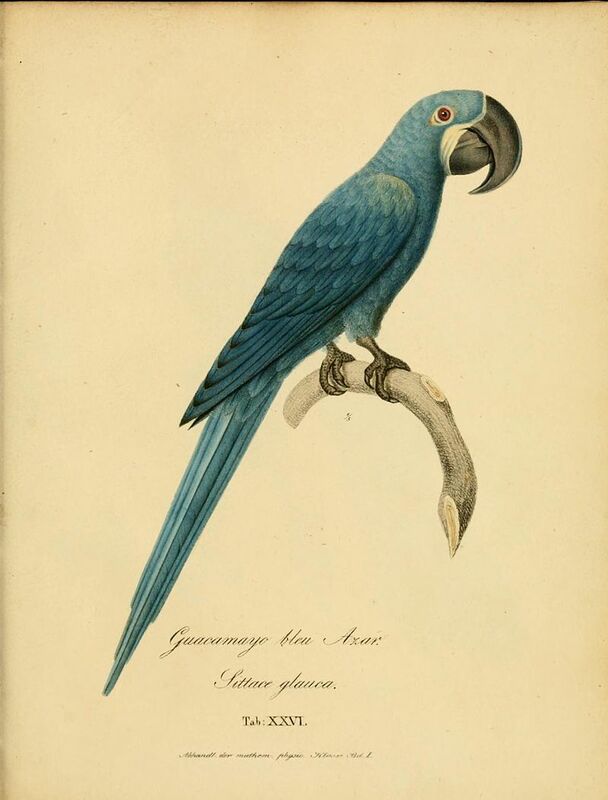 The scientific debut of the glaucous macaw took place in 1816, when it was formally described by French ornithologist Louis Pierre Vieillot. Its distribution at that time appeared to encompass southern Brazil, central and southern Paraguay, northern Argentina, and northeastern Uruguay, but by the end of the 19th Century this once-common species had seemingly vanished throughout its entire range. 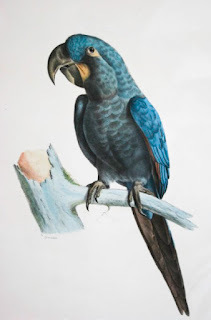 The reasons for this astonishing disappearance are still unknown, because the glaucous macaw had rarely been studied in the wild, although the major felling of yatay palms whose nuts were its staple diet, and the capturing of birds for the pet trade undoubtedly contributed. Over the years, however, a few specimens had been exhibited in various of the world's major zoos - one of these was received by London Zoo in 1886, and a well-known example lived at Paris's Jardin d'Acclimatation from 1895 until 1905. 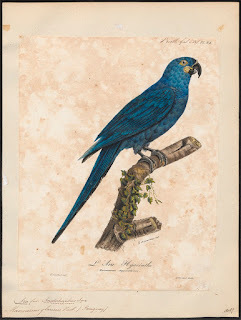 Indeed, it is often claimed that this Paris specimen was the very last glaucous macaw. 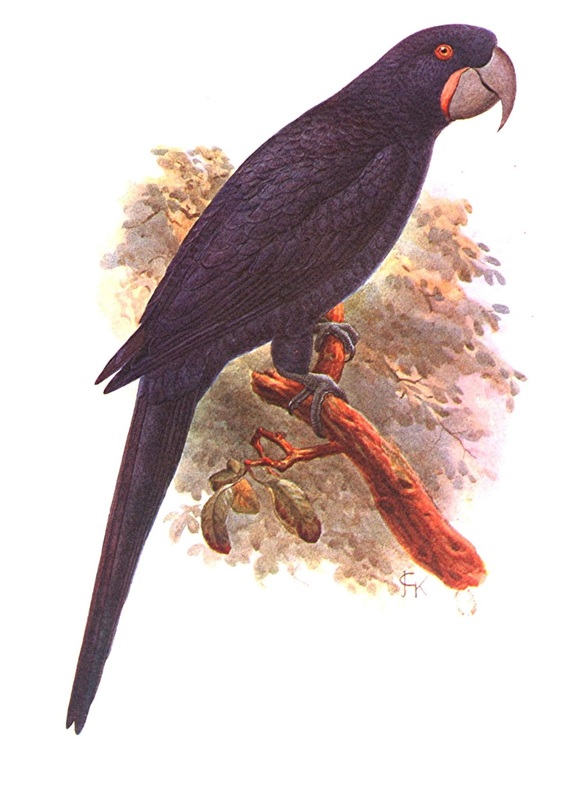 Conversely, some authorities confer that sombre distinction upon an individual that arrived at Buenos Aires Zoo in the 1920s and was still alive there in 1936, but there are others who believe that this latter bird was actually a Lear's macaw. Yet even if it was a genuine glaucous macaw, there is no certainty that it really was the last one. On the contrary, the published literature dealing with this exceptionally secretive species contains an appreciable number of reports alleging the much more recent existence of glaucous macaws, both in captivity and in the wild. Some of these are very vague, little more than rumours; but certain others are compelling enough to have stimulated cautious expectation within ornithological circles that this controversial bird's formal rediscovery is not very far away. For instance, in her book Macaws: A Complete Guide (1990), parrot specialist Rosemary Low revealed that in 1970 the late Rossi dalla Riva of Brazil, an occasional breeder of rare parrots and very knowledgeable regarding his local region's avifauna, claimed that glaucous macaws nested there, but he would not name the precise locality, fearing that local collectors would send their hunters to trap them. Low also noted that in 1988, after spending some months in the field (she did not name the area), a very experienced bird trapper came back home and announced that he had spied glaucous macaws, but had not been able to photograph or capture any of them. 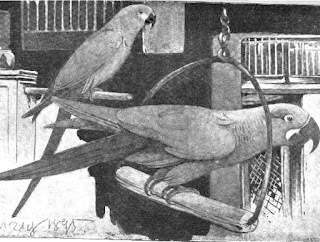 In his own book, The World of Macaws (1985), Dieter Hoppe noted that he had heard tell that during the 1970s a glaucous macaw had apparently been exhibited in a bird park either in Belgium or in the Netherlands, and that another supposed specimen had been alive somewhere in Australia during or around 1960. Hoppe also documented a much more tangible, firsthand encounter. 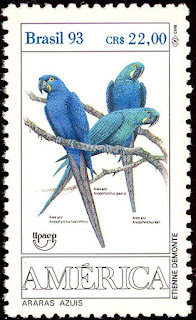 Several years earlier, he had visited an animal dealer who had shown him two very strange hyacinth macaws, much smaller than normal and with atypical sea-green plumage; Hoppe believed that these were glaucous macaws. In addition, he has published a photo of an odd-looking macaw assumed by the photographer, Tony Silva, to have been a Lear's macaw, but which was principally sea-green in colour instead of deep turquoise - another incognito specimen of A. glaucus? Certainly, there is a very real possibility that there are currently a number of unrecognised specimens of this scarcely-known species hiding 'undercover' in captivity, i.e. erroneously labelled as hyacinth or Lear's macaws. In 1982, writing in his Handbook of Macaws, Dr A.E. Decoteau claimed to be in regular correspondence with a European aviculturalist (no name or country of abode given) who was supposedly breeding a flock of glaucous macaws, from a tame pair that he had owned for several years. However, I have yet to see any mention elsewhere of this sensational programme of captive breeding. Perhaps the most promising of the glaucous macaw's many reputed reappearances in modern times took place during February 1992, following the arrival at British Customs of a pair of Lear's macaws imported by parrot breeder Harry Sissen on loan from Mulhouse Zoo, situated near Strasbourg, in France. When he came to Customs to inspect them, Sissen was amazed to find that the female seemed to be a glaucous macaw. 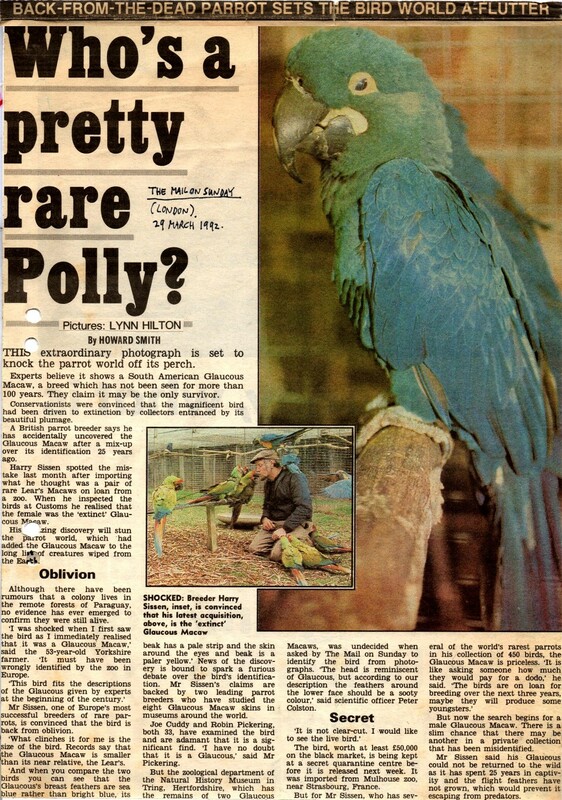 On 31 March 1992, London's The Mail on Sunday newspaper contained a fascinating full-page account of this remarkable episode written by Howard Smith, which included an excellent colour photograph snapped by Lynn Hilton that clearly portrayed the sea-green colour of the bird's breast and head, with indications of brown markings present upon its throat. 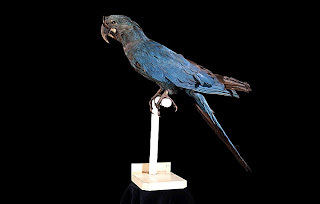 Subsequent to its arrival in Britain, this extraordinary specimen was scrutinised by at least two leading parrot experts, Robin Pickering and Joseph Cuddy – among the very few people to have examined every one of the eight preserved skins known to be from genuine glaucous macaws, housed in various of the major museums across the globe. Neither of them reportedly had any doubt regarding the bird's identity as a bona fide A. glaucus. Moreover, Peter Colston, then scientific officer at the London Natural History Museum's ornithological department at Tring in Hertfordshire, was shown photos of the bird by The Mail on Sunday, and he agreed that its head was reminiscent of the glaucous macaw's. However, he also pointed out that it did not seem to possess this species' characteristic sooty facial feathers. At present, therefore, Sissen's import remains unidentified. It may yet prove to be nothing more than a Lear's macaw (albeit an aberrant, green-tinged one). Yet if it really is a glaucous macaw and can be demonstrably shown to be one (perhaps by comparative DNA tests), and if other incognito specimens hiding in plain sight can also be found and unmasked, then the only sizeable species of South American bird believed to have become extinct since this continent's western colonisation will be extinct no longer, and the search for the sea-green scarlet pimpernel of the parrot world will finally be at an end. Having said that, expeditions by ornithologists during the 1990s to southwestern Paraguay, a potential hideaway for surviving glaucous macaws, failed to uncover any evidence for its continuing existence. Only the region's oldest residents had any recollection of this species, which was apparently last confirmed there more than a century earlier, back in the 1870s. Conversely, the late George Smith, a naturalist who was very informed regarding the history of the glaucous macaw, believed that it still survived in remote areas of Bolivia, where trappers encountered by him were able to identify it. Smith also noted that when he had flown over these areas, there were vast stands of palm trees, "as far as they eye could see", but these have still never been scientifically investigated, so who knows what secrets they may be hiding? Tellingly, the IUCN still categorises this enigmatic bird as Critically Endangered rather than as Extinct. Moreover, if we wish to confirm that the longterm concealment of a brightly-hued parrot species of stature in South America is by no means impossible or even unparalleled in modern times, we do not have to look far to offer a very apposite precedent, no further in fact than one of the glaucous macaw's very own congeners – Lear's macaw. The existence of this famously elusive species first became known to science in 1831, when Victorian bird painter and nonsense-rhymes writer Edward Lear painted a macaw of unrecorded origin that he believed to be (and duly labelled as) a hyacinth macaw but which was later recognised to be a separate species. In 1856, it was named in honour of him by French biologist Charles L. Bonaparte (although some authorities also refer to it as the indigo macaw). 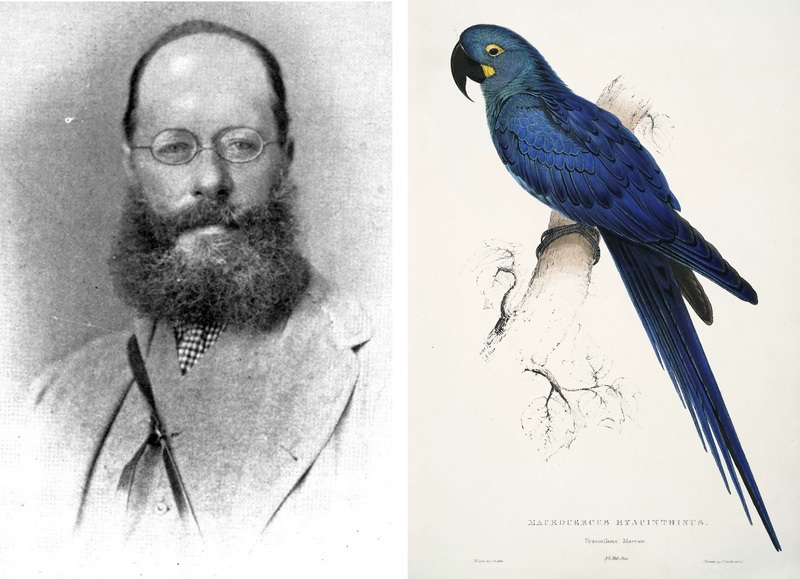 Yet despite having been represented in aviaries worldwide since 1831, Lear's macaw remained a major conundrum to ornithologists for over a century - because no-one knew where these captive specimens had actually been caught. Not even their country of origin, much less their precise provenance, was known. 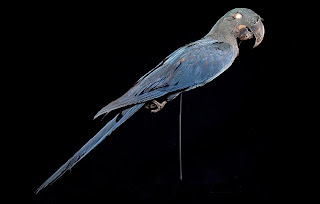 Indeed, a prevalent view back then was that this species might even be extinct in the wild - always assuming that it was a valid species, and not a hybrid of the hyacinth macaw and the glaucous macaw, as some researchers were beginning to suggest. In 1964, the late Dr Helmut Sick, a German-born Brazilian ornithologist, began an intensive programme of searches for this mysterious missing macaw in a bid to solve its riddles once and for all. It was a programme that would take 14 years before success arrived, but arrive it did. On 31 December 1978, he spied three Lear's macaws in a little-explored area of Brazil's northeastern Bahia region, called the Raso de Catarina. And in January 1979 he sighted a flock of about 20, proving that it was not a hybrid form. These turned out to be part of a population numbering just over 100 birds. Moreover, in June 1995, a team of Brazilian biologists discovered a second population of Lear's macaw, several hundred miles from the first one, consisting of 22 birds on a nesting cliff. By 2010, the total wild population was estimated to be just over 1,000 birds, and it is also represented in captivity. Although only three species of Anodorhynchus macaw are formally recognised nowadays, there was once an alleged fourth, and even a fifth, member of this genus. The fourth, of which more is known, is (or was) the purple macaw, the fifth the black macaw. 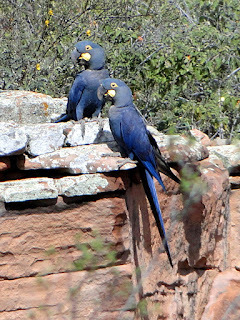 As noted earlier here, in terms of plumage colouration this genus's official trio of species can be arranged in a very neat gradation, beginning with, as its name indicates, the intense hyacinth-blue shade of the hyacinth macaw, then moving subtly into the slightly more turquoise-blue hues of Lear's macaw, which then transforms further, yielding a paler, turquoise-green or sea-green shade, in the aptly-named glaucous macaw. But what if this colour gradation were also extrapolated in the opposite direction? That is, in addition to the hyacinth macaw's striking blue hue faintly greening into turquoise and thence even more so into a glaucous tone, how about deepening it, to yield a macaw whose plumage was a darker, predominantly violet or purple shade? If this quartet of macaws were then arranged in a continuous linear spectrum of transforming colour, running from purple into blue into turquoise-blue into pale turquoise-green, the line-up would be: purple macaw, hyacinth macaw, Lear's macaw, and glaucous macaw. 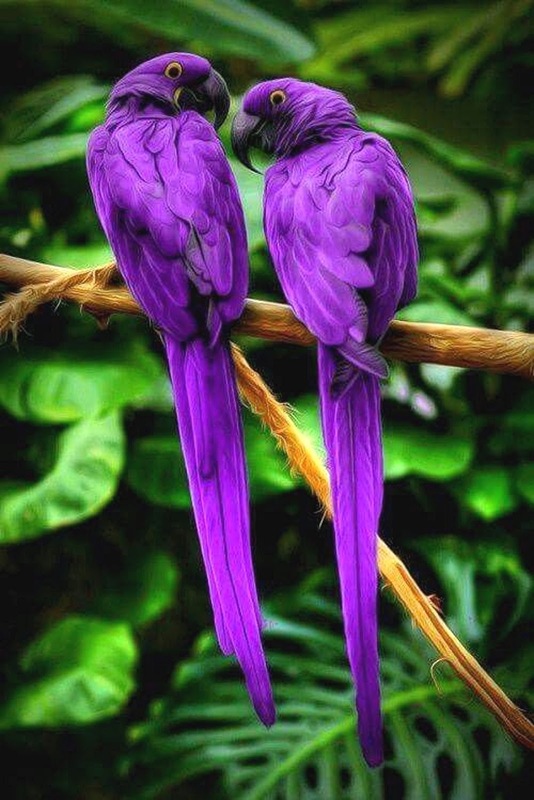 Of course, the purple macaw is purely hypothetical – isn't it? In reality, such a bird may actually have existed – so if you'd like to read about the purple macaw's fascinating history, as well as that of a possible fifth Anodorhynnchus species, the even more obscure black macaw, as prepared by me exclusively for ShukerNature, all you need to do is click here! This ShukerNature article is very greatly expanded and updated from my original 1993-published coverage of the glaucous macaw contained in my book The Lost Ark, which in turn was the first in my trilogy of groundbreaking, definitive tomes collectively documenting new and rediscovered animals of the 20th and 21st Centuries. Incidentally, please note that my glaucous macaw coverage did not reappear in either of The Lost Ark's two sequel tomes – The New Zoo (2002) and The Encyclopaedia of New and Rediscovered Animals (2012). So now, and constituting yet another ShukerNature exclusive, this is the first time that it has been reprinted (and updated) in more than 25 years. Unlike Great Britain, relatively few reports emerge from Ireland concerning mystery cats of the very large puma-like or black panther-like varieties. Yet this island is far from bereft of feline mystery - on account of the Irish wildcat. It was traditionally thought that wildcats had never existed in the Emerald Isle, but in more recent times fossil evidence has emerged to confirm that such cats did indeed exist here up until approximately 3,000 years ago (see later). Moreover, there is a sizeable albeit highly controversial archive of reports on file claiming that bona fide Irish wildcats have been actually been sighted right up to and including the present day. More remarkable still is that these reports of alleged Irish wildcats have suggested a closer relationship for these felids to the African wildcat Felis lybica than to the European one F. silvestris. Some of the material in support of Irish wildcats stretches back centuries, interwoven with ancient Celtic mythology. For example, an archaic poem believed to date from the 9th Century (translated by Eugene O'Curry and published by Sir William Wilde) tells of the Irish hero Fin mac Cumhaill being held captive by the king of Erinn, Cormac mac Art, who pledged to free him only if a male and female of every species of wild animal inhabiting Ireland were brought to him at the ancient city of Tara. The poem subsequently lists many different animal forms, including a pair of cats brought from the cave of Cruachain. While on the subject of Irish mythology: in an article of 6 December 1941 in The Field, Irish writer Patrick R. Chalmers argued that despite the wildcat supposedly being unknown in both Ireland and the Western Islands, the warrior King Cairbar of Connacht was surely called 'Cinn Chait' on account of the pelt of wildcat that he bore on his casque. This leads to another aspect of the Irish wildcat mystery. 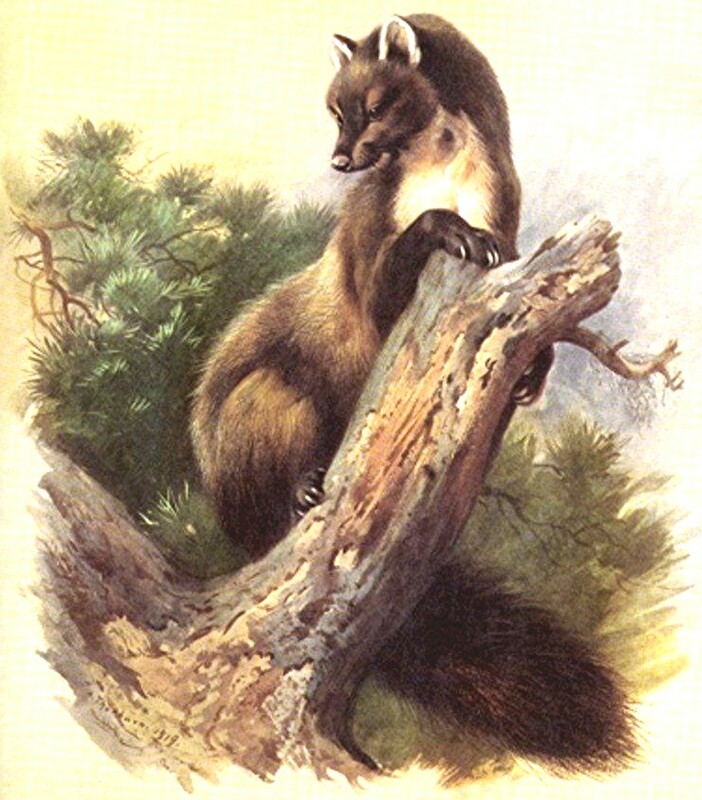 Chalmers's comments drew a response by letter from A. MacDermott, who maintained that this cat form has never existed in Ireland, and that in his own boyhood the name `wildcat' was actually applied not to any felid but instead to the pine marten Martes martes - an arboreal relative of the weasel. Compare this with information obtained nearly 50 years earlier by William Andrews, because he had discovered that the inhabitants of the remote glens of Kerry's western reaches knew of both the pine marten and an apparently genuine wildcat form. They even had separate names for the two creatures, calling the marten 'tree cat' and the wildcat 'hunting cat', thereby destroying MacDermott's notion that the Irish wildcat was nothing more than the result of an etymological ambiguity. The usage of 'hunting cat' in Ireland relative to supposed wildcats was also noted within the mammalian tome of the Reverend J.G. Wood's three-volume Illustrated Natural History (1859-63), together with an anecdotal account taken from Notes on the Irish Mammalia by the well-known Irish naturalist William Thompson. After having noted on several occasions grouse feathers strewn near a water-break in his Irish beat, as well as a number of grouse corpses beheaded but otherwise undamaged, the gamekeeper responsible for that area set a trap and caught two specimens of what appeared to be bona fide wildcats, one adult and one juvenile. Thompson had taken a particular interest in reports of alleged wildcat sightings in Ireland, notably in the mountains of Erris in the county of Mayo. He had himself seen a very large cat, weighing 10 lb 9 oz, which had been shot in the wild at Shane's Castle park, County Antrim. Apparently this specimen resembled the European wildcat in every way except for its tail (which was not bushy at its tip like the European wildcat's is) and its fur (which was of a finer texture). Consequently, when the Larne Journal reported in February 1839 that the wildcat occurred in Tullamore Park and also used to be found along the shores of Ballintrae, Thompson naturally sought out further details. He questioned Lord Roden's gamekeeper, who informed him that he had never seen wildcats in Ireland. All through his researches, Thompson encountered similar conflicts of opinion on this subject, and even his own ultimate conclusion is somewhat paradoxical. Even though he never became entirely convinced (at least not in print) of the wildcat's occurrence here, after comparing the Shane's Castle specimen with two Scottish wildcats Thompson nonetheless offered the opinion that it was probably a wildcat x domestic cat hybrid. Needless to say, however, in order for a wildcat hybrid to occur in Ireland, there must be pure-bred wildcats there in the first place. ...of a dirty-grey color, double the size of the common house Cat, and its teeth and claws more than proportionately larger. This specimen was a female, which had been traced to a burrow under the rock, and caught in a rabbit-net. With her powerful teeth and claws she tore her way through the net, but was gallantly seized by the lad who set the toils. Upon him she turned her energies, and bit and scratched in a most savage style until she was despatched by a blow from a spade. Although certainly fierce, feral domestics do not normally attain sizes larger than their tame counterparts (although as noted elsewhere in this present book, in recent years evidence has begun to accrue that extra-large melanistic ferals may be responsible in Britain and various overseas regions for certain sightings of unidentified medium-sized pantheresque beasts). Similarly, in his own wildcat write-up, Wood did not attempt to ally ferals with the much larger and mysterious cat form typified by the beast in the above incident documented by Maxwell. In any case, both in Wood's time and in the present day, feral domestics are very familiar animals in Ireland, not likely to be mistaken for anything else. In or around 1883, while shooting rabbits near County Galway's Annaghdown, F.C. Wallace sighted an animal that in his opinion seemed to be a magnificent specimen of a genuine wildcat. As no physical evidence was obtained, however, no formal identification could be made. 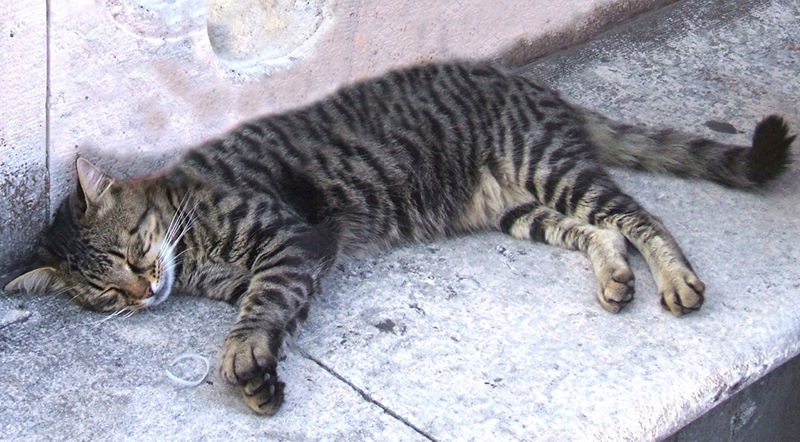 If the Irish wildcat controversy were ever to be resolved, it was evident that a specimen would have to be procured and submitted for official scientific examination. Such an event appeared, at least initially, to have finally taken place in 1885. 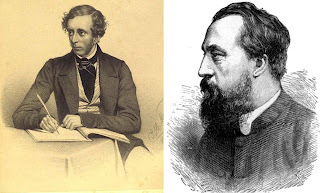 For on 28 January of that year, English naturalist William B. Tegetmeier exhibited the skin of an alleged wildcat from Donegal at a meeting of the Zoological Society of London and subsequently permitted Dr E. Hamilton to examine it thoroughly. 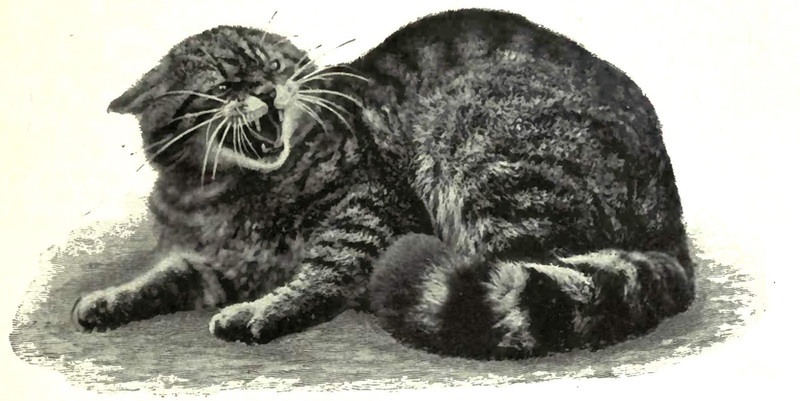 In the Society's Proceedings for 3 March 1885, Hamilton's report on this specimen was published - in which he unhesitatingly classified it as merely a feral domestic cat, and included excerpts from letters by earlier researchers interested in the Irish wildcat saga all supporting his own belief that the latter felid did not exist. Irish wildcat R.I.P.? Not quite - because a most unexpected discovery was made just a few years later that added a completely new dimension to the mystery. In the report of the Irish Cave Committee sent to the British Association meeting in 1904, Dr Robert F. Scharff announced that he had discovered amongst a collection of felid subfossil remains obtained from the Edendale and Newhall Caves near County Clare's Ennis, a number that constituted two distinct series, one small in size, the other larger, and that he considered the larger to be of wildcat identity. 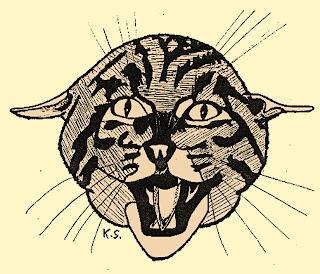 Moreover, in a short report published by the Irish Naturalist during April 1905, Scharff dramatically reopened the case for the modern Irish wildcat by stating that the position and nature of the bones found suggested that the felid was not long extinct in Ireland, and that it was even possible that a few specimens still survived in the western regions' more remote mountainous areas. Scharff then went on to comment that, until then, it had always been assumed that if a wildcat did actually exist in Ireland it would naturally belong to the Scottish form. 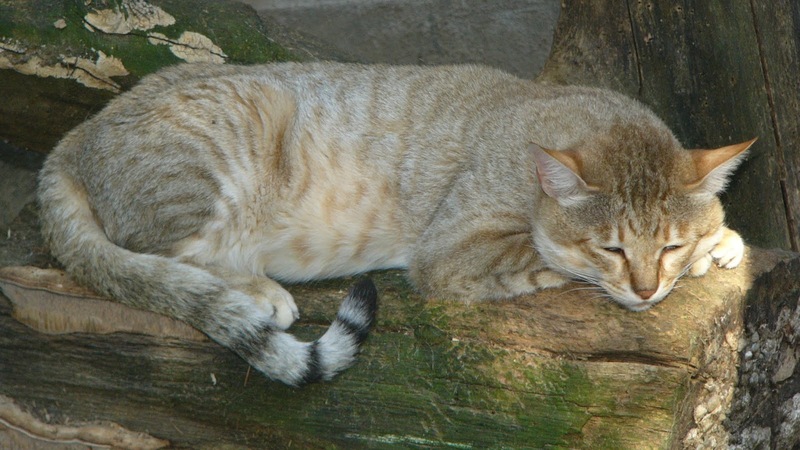 However, as a startling climax in his report, Scharff disclosed that the County Clare cave remains were comparable not with the Scottish but with the African wildcat, and that its tail was not bushy at its tip but pointed - just like that of the sizeable cat observed by William Thompson. This complete turnabout in the tale of the Irish wildcat resulted in a series of letters on the subject by other interested parties appearing in the Irish Naturalist during subsequent months. Some received Scharff's findings favourably and contributed further news regarding the Irish wildcat; others were more critical and remained sceptical. For example, R. Welch related an old fisherman's account originally given to Irish entomologist William F. de Vismes Kane concerning the wildcat's supposed existence in some numbers on the banks of Lackagh. 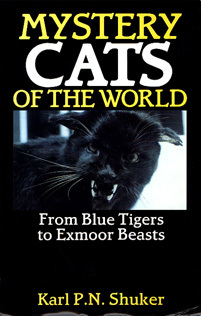 Conversely, Robert Warren poured cold water on this report, arguing that if such cats were indeed so common within this wild and little-traversed region, then some representatives should still be there today. Yet as noted later by Scharff, in view of the above-mentioned similarity between feral domestic cats and African wildcats (both having tapering tails), perhaps they are. Warren also attested that the finding of sub-fossil bones of a wildcat in Ireland did not prove that the wildcat was a native of Ireland. This was a quite paradoxical statement to say the least, which the editors of the Irish Naturalist were swift to point out in a footnote at the end of his letter of June 1905. The following year, Scharff published his findings as a scientific paper in the Proceedings of the Royal Irish Academy, Series B, describing fully the unearthed remains. 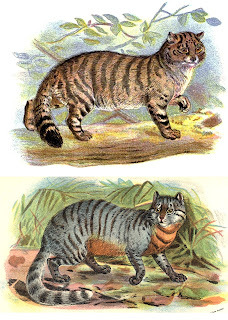 Meticulous comparisons made by Scharff between these and specimens of Scottish and African wildcats were also included, and which demonstrated conclusively in Scharff's opinion that the Clare cave remains were indeed most closely related to the latter wildcat. Similarly, Major G.E.H. Barrett-Hamilton, a prominent British-Irish natural historian, had planned to include historical evidence favouring this felid's existence in a forthcoming book on British mammals. Unfortunately, however, his untimely death in his early 40s prevented this data from being published. Nevertheless, one would have expected Scharff's researches to have been of sufficient importance in themselves to have initiated a new surge of interest and investigation regarding the Irish wildcat enigma. Instead, the possible existence of modern-day wildcats living in Ireland is nowadays totally dismissed - but why? 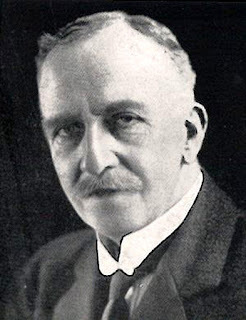 In an Irish Naturalists' Journal paper of July 1965, Belfast-born wildlife authority Arthur W. Stelfox re-examined Scharff's findings, and offered a very different explanation for them. First of all, he considered that Scharff was too willing to accept anecdotal evidence of Irish wildcats unconditionally, and gave the Tegetmeier specimen as an example, which Scharff had used in support of their existence (even though it had been denounced as a feral domestic by Hamilton). And as far as the cave remains were concerned, Stelfox was convinced that a much simpler explanation than Scharff's was available for these. 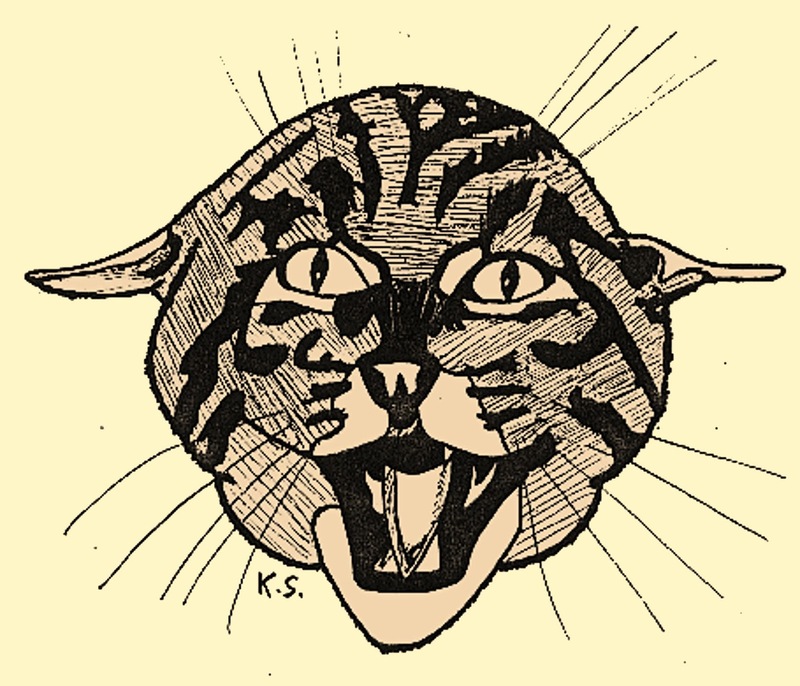 Namely, that instead of the smaller ones being domestic cats and the larger ones being wildcats, both sets were of domestic identity - the smaller being females and the larger being males (especially as the two sets were found at the same geological level and in the same mineralised condition). Stelfox also noted that although one would expect remains of fossil wildcats to be associated with those of other wild fossil species of mammal in Ireland if it did indeed harbour wildcats at one time, no such find had been discovered. Instead, all cat remains known from Ireland had occurred only at levels where the bones of domesticated mammals had been found, and Stelfox reported that he had not uncovered evidence of any cat remains in Ireland dating back further than the Bronze Age. However, this is no longer true, as revealed in an extensive Quaternary Science Reviews paper published in 2014, whose co-authors included Queen's University Belfast biologist W. Ian Montgomery and the University of Manchester's veteran British mammals expert Dr Derek W. Yalden. They disclosed that fossil European wildcat remains dating variously from 9,000 to 3,000 years old had indeed been discovered in Ireland. Moreover, sightings of large felids not readily explained away as feral domestics have continued to emerge from Ireland. In 1968, for example, while seeking lake monsters in western Ireland, Captain Lionel Leslie and his team were taken aback when a very sizeable felid suddenly appeared on the opposite side of Connemara's Lough Nahooin (i.e. only about 100 yards away) from where they were standing. According to team member F.W. Holiday, who subsequently documented this encounter in his book The Goblin Universe (1986), Captain Leslie stated afterwards that he had never seen anything like it before. Dublin zoologists later contacted by Leslie concerning this were equally bemused - a suggestion that it might simply have been a fox was flatly rejected by the team. More recently, in their excellent book The Mystery Animals of Ireland (2010), authors Gary Cunningham and Ronan Coghlan noted that in May 2003 a very elderly man from Connemara named Francis Burke affirmed that wildcats had been reported here. He claimed that they were bigger than domestic cats and occurred mostly in wooded areas. In February 2002, Sandra Garvey saw an animal while driving at night at Knockfune (Co Tipperary) which shocked her so much she nearly drove off the road. She described it as larger than your average moggy with a very striking tail. It transpired that Mrs Garvey's sighting was not an isolated one, with eyewitnesses coming forth, including park ranger Jimmy Greene who spotted such an animal with its two kittens whilst patrolling the Slieve Bloom Mountains in Co Offaly. Appended to this report in their book was a detailed drawing by Gary Cunningham based upon Sandra Garvey's description of the cat that she had spied that evening, and the result is a burly tabby-striped felid with a sharply-pointed tail that looks very like a bona fide African wildcat. Even today, therefore, it would seem that with leprechaun-like elusiveness, the Irish wildcat continues to evade explanation. This ShukerNature blog article is excerpted and expanded from the Irish wildcat coverage in my book Mystery Cats of the World.